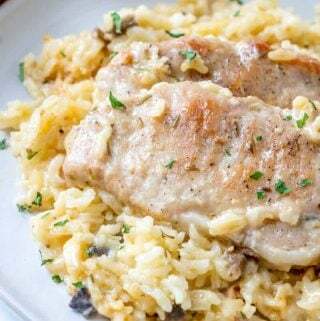 Easy, herby and flavorful this Baked Porks & Rice recipe is a fork tender, filling dinner recipe that the whole family can and will enjoy. Season your pork chops on both sides with salt, pepper, onion powder and 1 tsp rosemary. In large saute pan add 2 Tbs vegetable oil and brown pork chops on both sides for about 3-5 minutes. Remove from heat and place in a 9"x13" pan, set aside. Meanwhile in medium saucepan add cream of mushroom soup, cream of chicken soup, milk, remaining rosemary and thyme and whisk together until blended then stir in your rice. Add in your butter and then place saucepan on stove and heat to a gentle boil stirring until butter is melted. Pour over pork chops, cover with tinfoil and bake for 2 hours.